← What’s brewing in Slow Happy Runner Land? Slow Happy Brewing: The adventure begins! Yesterday was Brew Day! My friend and I began the process with great excitement. We’d already pre-sanitized all the containers and instruments the day before. We’d received and reviewed the water quality report from the company that bottled the water we planned to use. We’d gathered everything we needed and arranged things next to the stove in the daylight basement room formerly known as my home office. My home’s previous owner had used this room as a mother-in-law apartment — that’s why there is a stove and a sink there. The stove, however, had not been used in several years. It was last turned on by the home inspector when Kurt and I bought the house five years ago. My friend and I turned on two of the burners and they heated up just fine. With a small sigh of relief, we began heating water in a giant brew kettle. 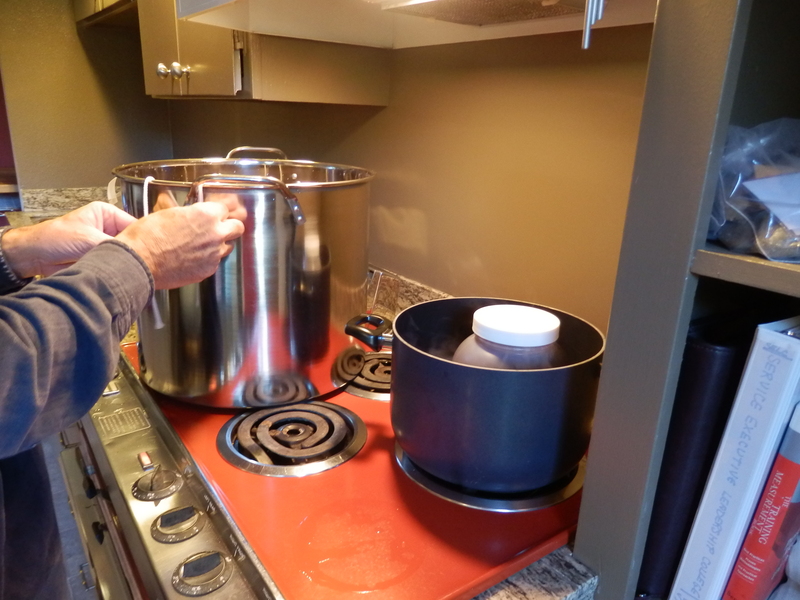 We also began gently heating our bottle of malt extract so it would pour easily when the time came to add it to the brew kettle. Into the brew kettle we put one pound of lovely, aromatic ground Crystal barley malt, and the room filled with a luscious malty odor. We turned up the heat on the brew kettle. Suddenly I noticed smoke rising from around the edges of the stove where it meets the countertop. Within seconds the entire stove top was smoking! So I called 911. The smoke was already dissipating but it was pretty hazy and smelly in the room. The dispatcher calmly asked me questions and then asserted that it was, indeed, a good idea to send out the fire department. Meanwhile my friend had situated the beer on the kitchen stove and come back downstairs to turn off the breaker. He greeted the two firefighters and showed them to the office, which of course looked like a chemistry lab with all the brewing paraphernalia. It smelled like a chemistry experiment gone waaaay bad. Using their nifty infrared heat detector, the firefighters determined that the area to the left of the stove had heated up quite a bit, but there was no sign of combustion. They concluded that old grease and dirt under the burners had simply started to smoke, but they also believed that the stove had probably been installed with too little clearance on the left side. They advised me to have someone pull it out and inspect it before using it again. I am not touching that stove ever again!!! I think I will pull it out forever and install shelving or something in its place. Meanwhile, upstairs, the 1.5 gallons of water in the brew kettle was heating on the kitchen stove. We bid farewell to the friendly, helpful firefighters and went upstairs to wait for it to boil. While waiting for the boil, I read the instructions on the yeast packet. I learned that once the yeast is activated by breaking an inner packet and shaking vigorously, it needs to grow for three hours before being added to our proto-beer. Oops! We were only supposed to boil for 60 minutes. How were we going to stall for another two hours? Well, we waited… and waited… for the water to boil. My kitchen stove doesn’t seem to be that hot, even at the highest possible setting. Finally we had something resembling a boil, so in went the 7 pounds of light malt extract and the first of our hops. Now we had a “wort” (that’s what a batch of boiling beer ingredients is called). 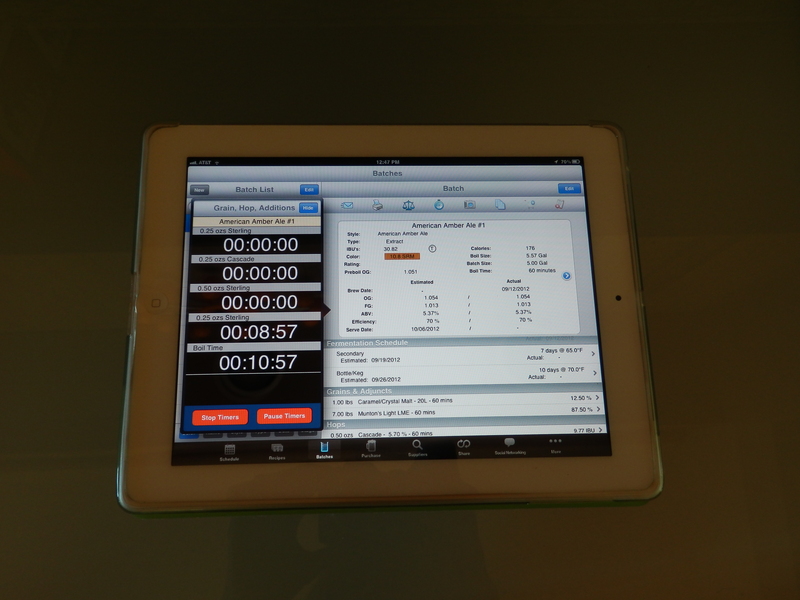 I started the timers on my iPad brewing app. Every 20 minutes or so, a timer would go off and we’d add more hops. They are lovely dried flowers that smell wonderful. 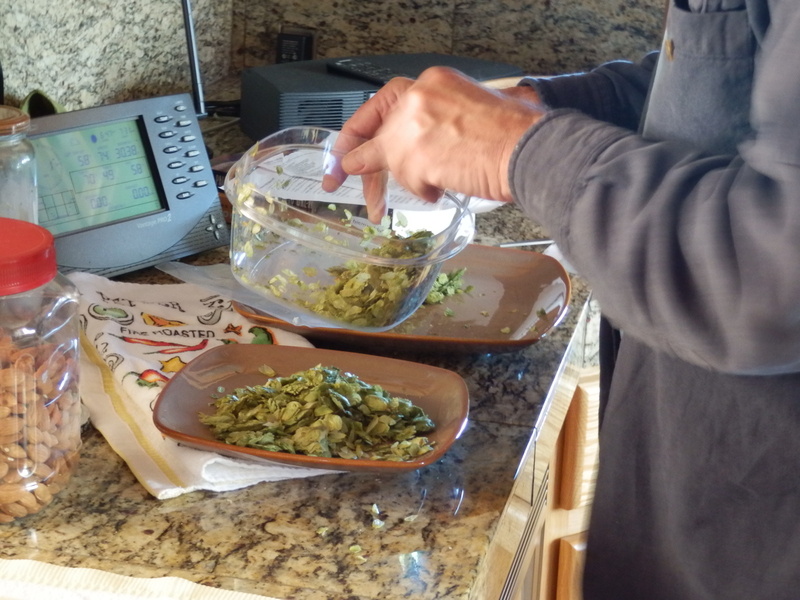 Without a kitchen scale, we could only eyeball our measurements, but all of the hops went into the kettle eventually. I continued to monitor the timers on my brewing app. At last the 60 minutes were up! Now my friend had to carry the hot brew kettle downstairs to the laundry room, where an ice bath awaited. 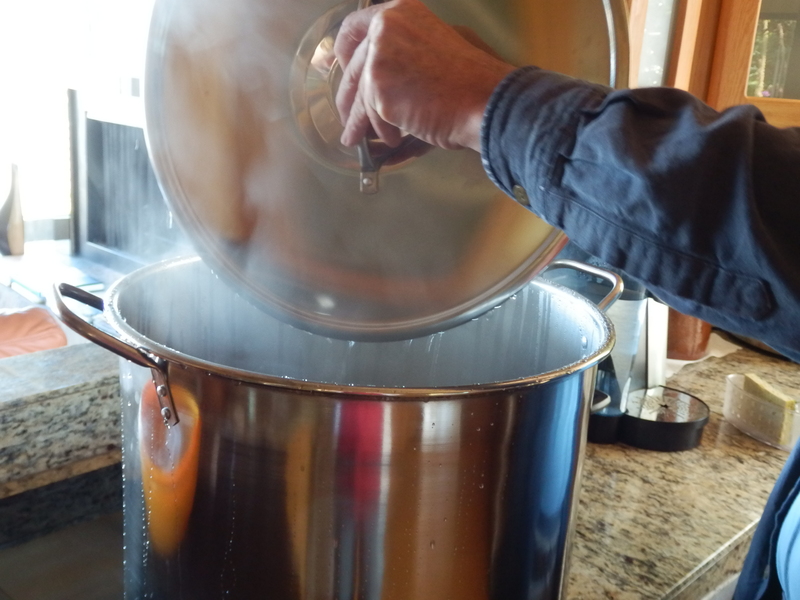 The idea is to cool the boiling wort as quickly as possible down to 70 degrees. We would then add the yeast, which had been foaming away in its packet for nearly two hours at this point. We didn’t have enough ice. We couldn’t get the danged kettle cooled below about 90 degrees. Finally it occurred to me that since we were going to add 3.75 gallons of cold water (we’d stashed the bottles in the refrigerator) maybe those 3.75 gallons would take us down to 70 degrees. With great excitement we poured the 3.75 gallons into the glass carboy. We then poured the contents of the brew kettle (running the wort through a strainer to catch all the hops residue) into the carboy. This brought the temperature of the wort down to 62 degrees. Gnashing our teeth, we ran around collecting hair dryers and dish towels. I bathed the carboy with dish towels soaked in hot water while my friend aimed two hair dryers at it. By this point we didn’t know whether to laugh or cry, so we laughed! Finally we hit the magic 70 degrees. 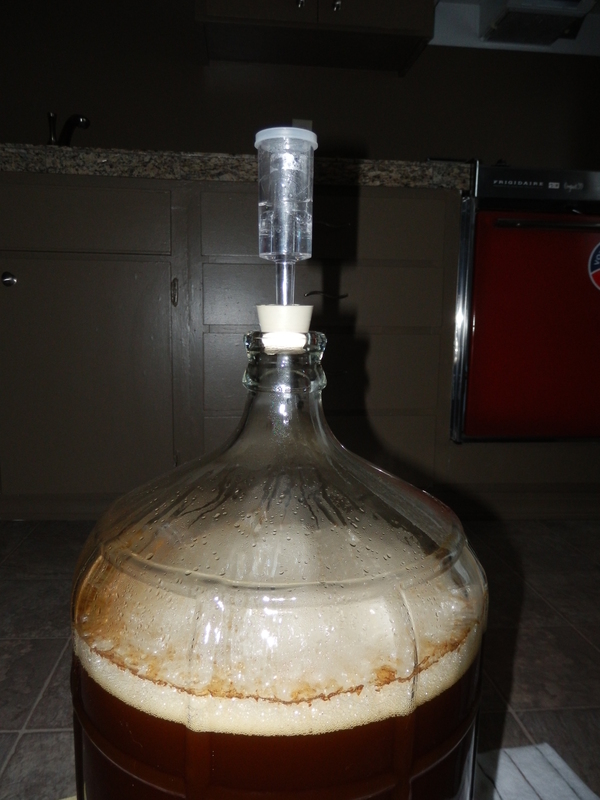 With a mighty flourish, my friend popped open the yeast packet and poured the contents into the carboy. Just over three hours had passed since we’d started the yeast and wondered how we’d ever kill all that time. 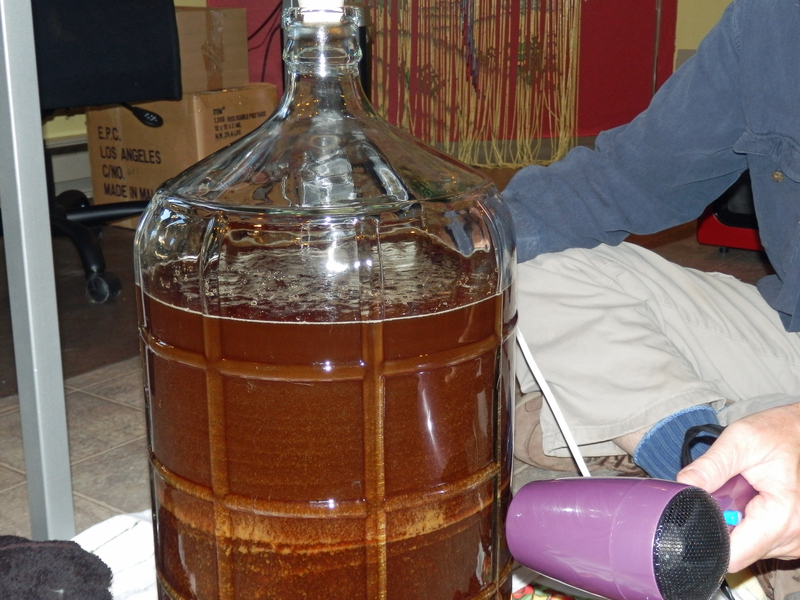 Several hours later, the liquid in the carboy still looked completely inert. But this is what I saw this morning! Beer is happening! Billions of yeast cells are doing their thing, feeding on the sugars in the wort and converting them to alcohol! Yippee! A week from now we’ll siphon into another carboy for a secondary fermentation cycle, and then in another week we’ll bottle. Our beer should be ready to drink by the first week in October… right around my birthday. It may not be world-class beer, but it will be memorable. If Slow Happy Runner is an apt moniker for myself, then surely Slow Happy Brewing is the right name for our microbrewery. We stumbled and backtracked and called 911 and laughed our way through an exhausting half day’s work, but we’re very, very optimistic about the outcome. I’ll keep you posted. But now I think I’ll go for a run. Posted on September 13, 2012, in Brewing and tagged brewing. Bookmark the permalink. 12 Comments. I say, sounds like a bit of a Monty Python sketch going on here. Now all you need is a manicial mole killer and you’ve got a BBC programme. Thank goodness I DON’T need a mole killer! But yes, we were definitely in Monty Python territory yesterday. What a hoot! Can’t wait to hear how it goes. BTW, saw a yellow Cayenne (I think the same interesting variation) on the freeway yesterday (specialized plate= SANN) and thought of you. I’ve yet to see another yellow one, although I hear about them now and then. What, and miss out on all this fun? “Slow Happy Brewing” says it all for me. Now… I’m still not sure what to name this first batch. I’ll probably need to taste it before naming it. I don’t want to jinx anything!